Sudoku has become a huge hit across a multitude of mediums: from the daily newspaper to your mobile phone. Click here to play! Now, you too can enjoy the excitement of Sudoku, without having to rack your brain for which number to choose! 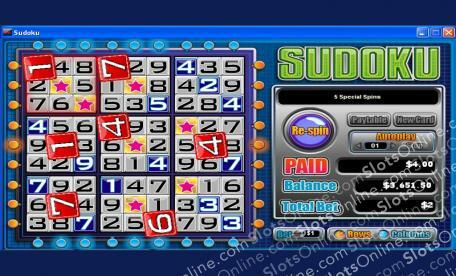 Sudoku is a left-of-center slot machine that doesn't utilize traditional reels or lines. Instead, you are able to select new cards whenever you wish, which will jumble the numbers and allow you to start anew. The object of the game is to get Sudoku across the rows, columns, and squares. You will receive 15 free games when you complete 5 or more squares, and the Sudoku feature is triggered when you earn 7 or more red Sudoku numbers. The Sudoku feature grants you 5 Re-spins which can win you the lucrative Top Prize. In addition to all of these features, you will be paid on standard column and row wins, all the way up to 6000 times your bet! So join in the Sudoku revolution today, and win yourself a stack of cash! The Sudoku Star is Wild and will Substitute for any other number in the game, except when in the Sudoku Feature.